This third picture shows a rescue boat that is well-equipped, full of motivated, inspired Christians who are effective in their work of rescuing people from the perilous sea. 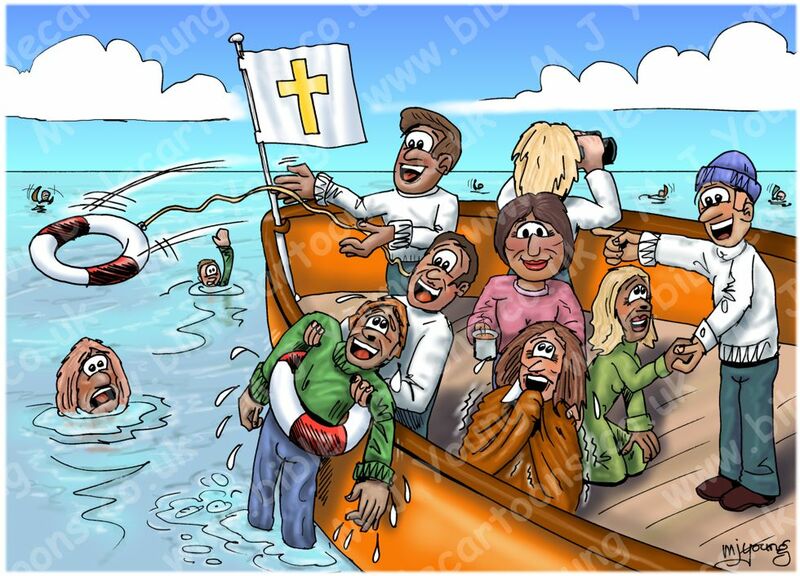 The cross on the flag shows that the boat is a Christian church congregation. Unlike the cruise liner (see previous Meta4 Picture), the members of this boat are Christians who are aware that part of their job is to help save other people, who are in the sea. And unlike the previous picture, these Christians are well-fed, well-equipped & well motivated in their ministry of saving people! Notice that people are pulled from the sea, covered in blankets, given warm drinks (immediate needs met), helped up & directed (once they are fit, healthy & ready) to help save other people. 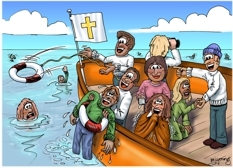 This is a picture of what happens in a really good, well-focused Christian church: people are rescued, & once they are ready to take their place in the “crew” they are put to work helping other people (still in the “sea” of their sins) to escape the clutches of the sea & clamber on board the “rescue boat” of Christianity. This third picture really shows how to do it: when a church congregation is appealing to people & is relevant & accessible to them, where they are, then we can hope/expect them to come through the doors & join us. Ultimately people are saved by a sovereign act of God, but as with all things, w have a vital part to play in making God’s church clearly promote a better way of life to people who are dying in our world. If we deliberately make our congregations “user-friendly” to non-Christians then we are helping them to see the relevance & attractiveness of the gospel to them, in their situation. We have to deliberately show the world that we have something that they are missing, & that they actually want: peace, love, acceptance, an eternal future, hope, etc.